Yoshi Wakao flew all the way from Japan to Ellös to look at the Regina Laska project when she was being refitted in 2012/13. 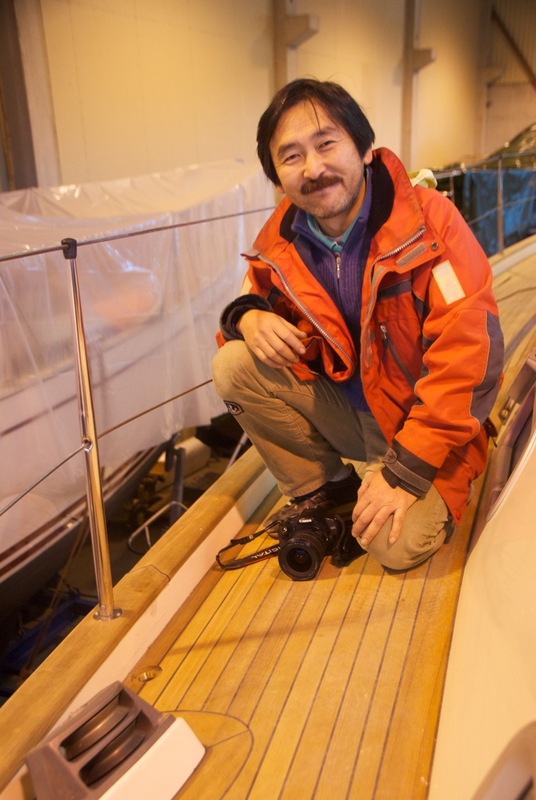 Yoshi was very impressed by the outstanding quality performed by Adams Boat Care and proven by the work done on Regina Laska, that he decided to do the same. Major work to be done on Crow’s Nest 7 will be a new Volvo Penta D3-110 engine with a new Flexofold Propeller with a custom requested gearbox to reduce revolutions. A new Aquadrive will also be installed. Further, a new Whisperpower GV8 Genverter will be replacing the existing Fisher Panda. This new Genverter produces power up to 8 kW with variable speed and hence variable noise, vibration and fuel consumption. Whisperpower is also to deliver a 110A alternator with an external intelligent regulator. Båtsystem will provide floor lighting to facilitate night sailing as well as indirect lighting in the aft cabin to increase the sense of space as well as warmth and atmosphere. Other very essential works done on Crow’s Nest 7 is a thorough rudder repair, which, amongst others, had a big play, partly due to the fact that the rudder had never been greased in the lower bearing. The diesel tank will also be totally cleaned, due to the fact that modern engines, such as the D3-110 are very sensitive to clean fuel. The Racor diesel filters will receive small valves for being able to drain sample fuel. From a comfort point of view, a new washing machine will be installed as well. 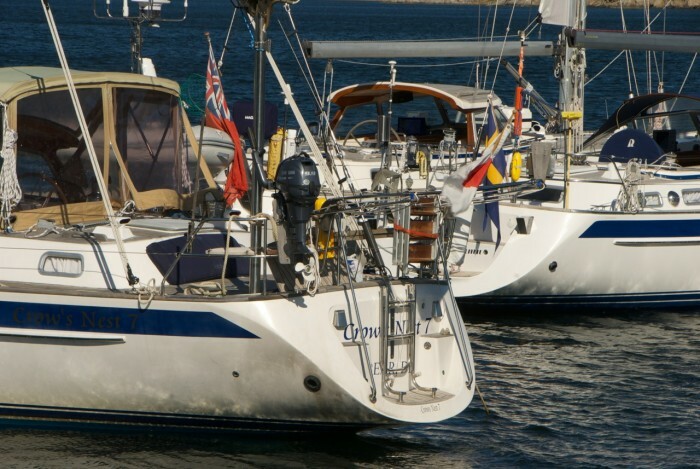 Of course, when you come to Adams Boat Care, many small items, requests and problems are being discussed as well, which are easy to solve and so cost-efficent to install or refit by the team. Since Yoshi Wakao is a very knowledgeable person, taking nothing for granted and only expecting the very best, he is in frequent contact with the team throughout the project, calling and e-mailing regularly from Japan, exchanging ideas and discussing his special requests. In spring 2015, when Crow’s Nest 7 is readily refitted, polished, shiny and reclaimed her original beauty when she was new, Yoshi will continue south into the Mediterranean Sea, it is planned. 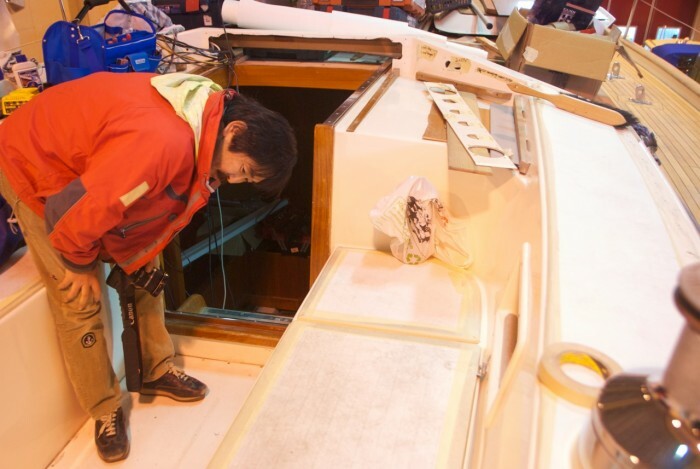 Yoshi Wakao investigating in detail how Adams Boat Care works and wishes to understand how the refit is being done on Regina Laska. 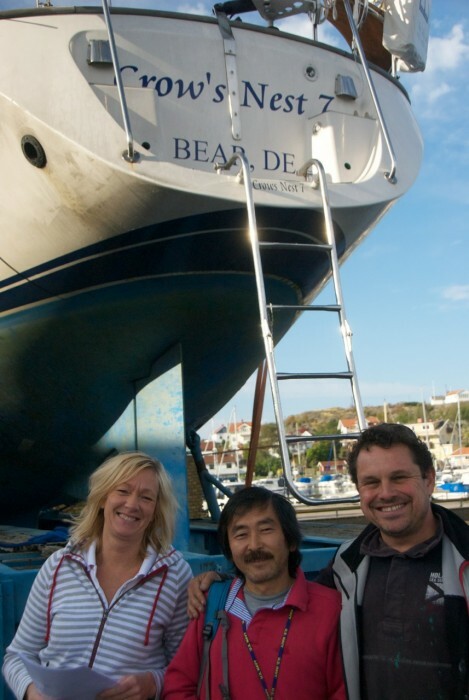 Anna Friberg (left) and Carl Adams (right) welcoming Yoshi Wakao (middle) to Ellös after a 6,300 miles sail to get Crown’s Nest refitted by Adams Boat Care. 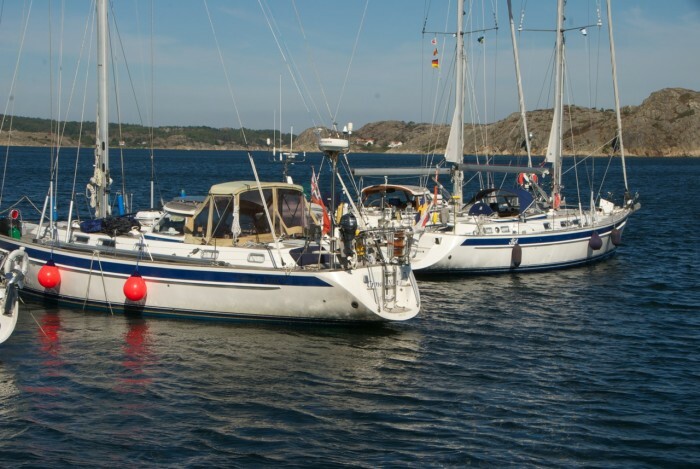 Three different ensigns on HR’s being refitted by Adams Boat Care in Ellös: Japan, Sweden and the UK.